For those who sign up for the Premium memberships, your vital statistics, along with your punting and kicking statistics, will be added to the members database. What's so important about the database, you ask? This database will be made available to college and professional coaches looking for someone like you to fill their roster. Scouting for kickers and punters is so much different from any other position, so we created the database to narrow the gap between coach and player. 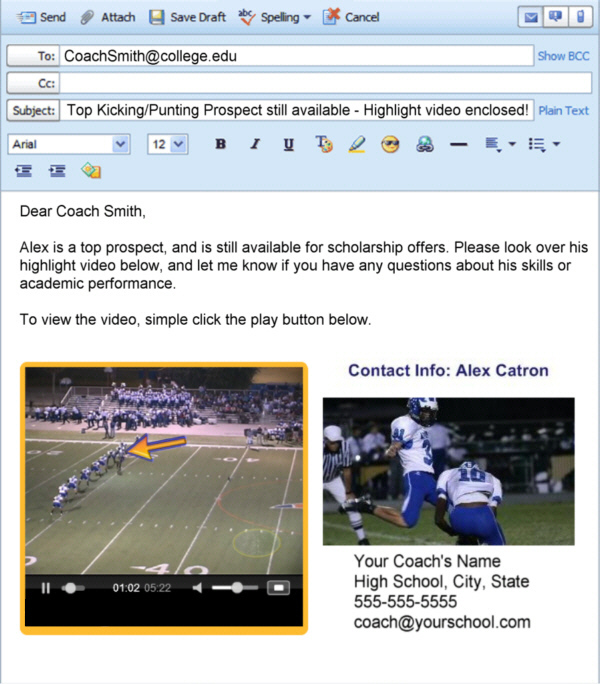 Coaches have free access to this database, so they will be able to search for the exact type of punter and/or kicker that they would like to recruit or have tryout for them. This should revolutionize the way kickers and punters are discovered. Take a look at those signed up already! Take a look at the list of teams who are already eagerly awaiting to search the database. This list will grow as more and more members sign up. We expect to be the first place that college, Arena, CFL and NFL coaches go to in order to find the kicker or punter they are looking for. Do you want to be left out? Think your stats alone will get you the attention you deserve from these teams? We cannot guarantee that everyone will get a chance at the next level, but by joining the database, you are giving yourself the best opportunity out there today. Here are the other benefits: Your own kicking.com website and URL. Attach the web address along with your highlight tapes, information letters, etc to an email or letter and let potential colleges check out your updated stats online! Anyone can type it in and view your personal profile (click on image above for a sample page). You can also see how your competition, rivals or friends are doing. This database is updated by you as often as you'd like. 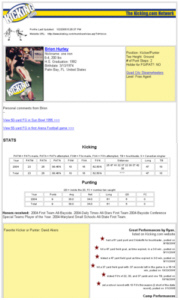 Not only are your stats included, but contact information for your coaches and kicking instructors, GPA, SAT/ACT scores for college hopefuls, and even expert contact information, so coaches can talk to someone who knows your kicking and punting skills best (high school coach, camp counselor, kicking instructor, etc). Take a look at the members already signed up! Sign up for a Kicking.com membership today! NOW only $3.99 per month, which includes the instructional section of the site as well. Very little payment for the possibility of getting a full ride scholarship or pro tryout! Can't afford it, or just want to store your stats and honors? We do have a free membership option, which allows you to create your personal webpage, but you do not get access to all the recipes, training, video lessons that come with the Premium membership.